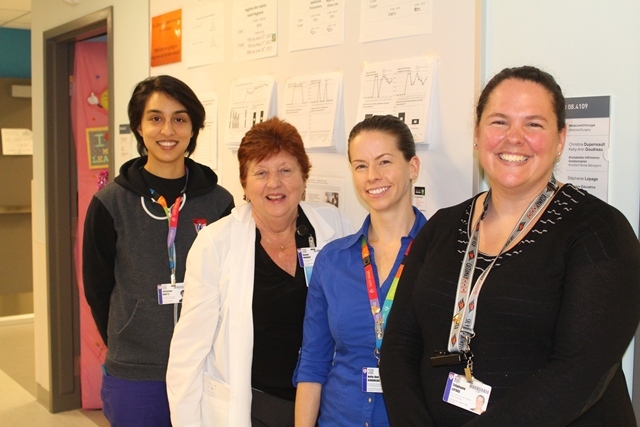 The team on B8 at the Montreal Children’s Hospital has recently addressed one of the most important patient safety issues—hand hygiene—with some outstanding results. “We were aware that not washing your hands is often unintentional, but our compliance rate was less than 50%, so we needed a plan to increase that number,” says Kelly Goudreau, Assistant Nurse Manager on B8. Kelly led the effort along with Donna Murray, Nurse Manager, Christina Duperreault, Assistant Nurse Manager, Stéphanie Lepage, Nursing Educator, and Christiane Martel, Nurse, who is also the unit’s Infection Control delegate. As a starting point, they adopted the Controlling Specific Infection Successful Strategies (CSISS) program, which incorporates a “Quality Station”—a white board to display relevant data that all staff can refer to. The five nurses were trained on how to audit team members’ hand hygiene compliance on a daily basis; they enter data on an app, which sends information to the Quality Improvement department, which then produces weekly reports. They also employed a key tactic with the team: talking about hand hygiene on a constant basis at every possible opportunity. “During morning rounds, we go through patient lists and discuss messages for the day so every single morning for the first few months, we talked hand hygiene,” says Kelly. One of their challenges was how to reach everyone on the unit on a regular basis. At the beginning they held short weekly meetings at the white board to review the data, but with nurses at bedside, and surgeons in the OR, they had to come up with a more creative way to communicate news. When they started the initiative, their goal was to reach an 80% hand hygiene rate, which is the level set by the Ministère de la santé et des services sociaux, as well as the requirement for Qmentum accreditation. “We’re now consistently above that figure and even reached 91% one week this summer,” says Kelly.